Would anyone care to identify or comment upon the musical quotations Korngold chose? Is there a thread common to all four of them? Last edited by Dennis Miller on Thu Nov 29, 2007 4:24 pm, edited 1 time in total. These look like quotations from his operas. 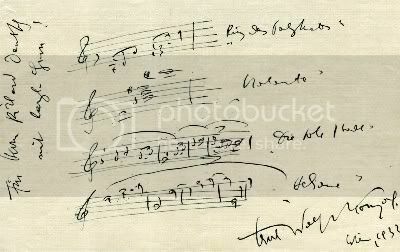 The first says "Ring des Polykrates" to the right, the second is the Violanta chord from "Violanta". The third I recognize outright from DIE TOTE STADT (Gluck, was mir verblieb), and the fourth says "Heliane" to the right of it.